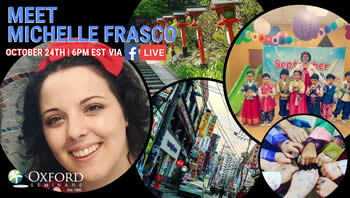 In the video below our grad Sierra talks to us live from Japan! 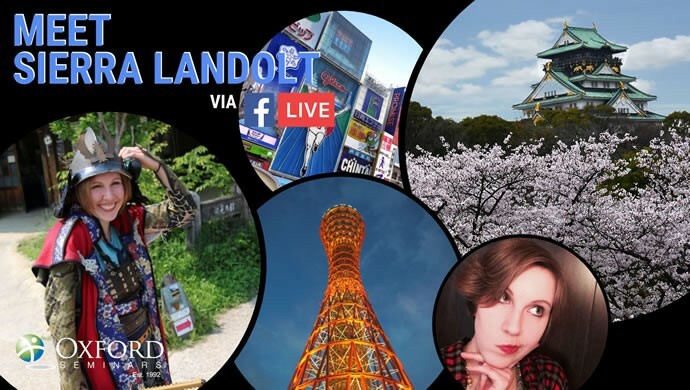 Watch to learn all about her adventure teaching English abroad, from certification to starting her ESL teaching job in Japan. The amazing thing about Oxford Seminars to me was that it [the course] was on weekends, and I could do that because I worked weekdays at the time. It was Saturdays and Sundays for 8 hours… It went by really quickly and [it was] a lot of information, but I took notes and stuff. He was very calm and [provided] positive reinforcement all the time… He was calm and confident about teaching English. And because we had those giant chunks of time on weekends, we had enough for each of us to teach at least a 45-minute class, which is a very typical classroom period. How did you find your job teaching English in Japan? A cool thing was that my Job Placement Advisor was also like “If you want to get a job next year in August we should start applying around February-April of the same year.” So he knew the period of time [when you needed to apply]…which was, I think, extremely valuable because I wouldn’t have any idea because different countries have different start dates, end dates, school dates. I teach several classes and I go to several different schools as well. It’s not just one class or one school that I go to. For me personally it’s so cool to see kids of a different country and different culture because they act so different from Canadian kids, but at the same time, because they’re still kids, they’re still silly and they still just want to have fun. It’s so fun for me to just be silly with them, and I get completely different reactions too. Like they all laugh, but they laugh for a different reason… because it’s Japan and not Canada. Can you share a day in the life of an ESL teacher? I wake up in the morning and usually the night before I’ll have planned out which school I need to go to because it is quite an adventure in itself figuring out how to get to my school sometimes. But yeah, so I’ll wake up, get ready, go to my school about 15 minutes early, and I teach with a Japanese teacher. Each class has an “FT” or a Foreign Teacher and a “JT” which is a Japanese Teacher. We teach together. What was included in your contract? They reimbursed me a certain amount for my flight to Japan, and then they also pay for transportation to and from work, which is really great. While they don’t pay for my accommodations, they have a partner company that…[will] help you find an apartment and pay for initial costs and stuff. They also assist you by taking the money out of your salary so you don’t really have to worry about paying for bills and paying for the apartment> So when I get paid, my apartment money will already be deducted because I went through this partner company… I don’t want to say it in a negative way, but [there’s] a lot of hand-holding. You’re in a new country. You don’t know how anything or everything works. So the first day that I got here or the day after, I was partnered up with a senior teacher, and the senior teacher brought us to the city office to get the residency card, brought us to a bank, brought us to the post office in order to get a bank account and mail, and [they] really walked us through getting what we wanted. I got a phone plan, but again with someone who knew what they were doing, and walked me through, and could speak Japanese! Do it! That probably feels pretty cliché, but…traveling internationally is…I think everyone in the world should do it in order to really expand their perspective of the world and learn how other people live. Teaching English is something that’s so sought after by so many people. I kind of feel like it’s an honor. I feel very excited that I have this opportunity to… share my native language to other people and I, myself being really interested in languages, can see that flip side: when people teach me their native language I appreciate it so much. So if people have the opportunity to teach, and [to] teach abroad, then I would say that it’s a very exciting opportunity and it’s actually quite a great honor… There’s so much appreciation for it.